Billie is the last of the children of Bert and Grace Snyder that I have to write about. I couldn't find any information in the history books, but I did find her obituary, which I am sharing here. 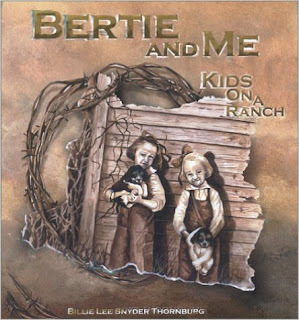 I met Billie in the early 2000's when I had the privilege of recording a narration of her first book, "Bertie and Me". She followed that up with three more books, "Bertie and Me and Miles Too", "Sandhills Kid in the City" and "City and Prairie Bones". All of these memoirs offer glimpses into Nebraska and North Platte's past. The books are out of print, but can be found on Amazon from third-party sellers. Billie Lee Thornburg, 96, of North Platte, passed away Feb. 14, 2009, at her home. She was born April 12, 1912, to Albert Benton and Grace Belle McCance Snyder in her grandfather McCance''s sod house a few miles north of Cozad. Her early years were spent on the family ranch 11 miles west of Tryon. She attended grade school in rural McPherson County. Billie was baptized in the Eclipse Episcopal Church at an early age. When Billie and her sister were old enough to attend high school her father Bert leased out his ranch and moved his family to Salem, Ore., where she graduated from high school. Billie was married to Tiny Riley, who later died of injuries from a rodeo accident. In 1955, Billie married William Robert Thornburg, a career Navy man. They lived in Japan for two years and in Norfolk, Va., where they were active in real estate. In 1977, they returned to North Platte to care for Billie''s mother. She was a dance instructor in North Platte for many years. At the age of 90 she began writing and was working on her fifth book when her health and eyesight began to fail. Among her books were "City & Prairie Bones," a story of North Platte''s "Little Chicago" days. She also wrote "Bertie & Me", "Bertie & Me and Miles, Too" and "A Sandhills Kid in the City." She formed The Old One Hundred and One Press Co. and published for others as well. She was an accomplished knitter, having made many beautiful sweaters. Billie was a people person and had gathered many friends over her long life. She also had a love for animals, most recently their cockatoo Charlie.